A rendering of the ill-fated Columbia River Crossing. What’s happening with the Columbia River Crossing, the proposed new interstate bridge in Portland, looks like a symptom of what’s wrong with America. We just can’t get things done any more, especially big things. 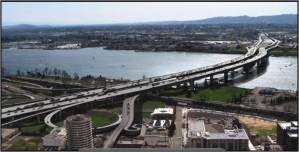 The twin I-5 bridges in Portland have to be replaced or fixed. So for more than 10 years, planning has taken place and eventually a design was chosen for a new freeway and light rail bridge. But the Washington legislature decided this year against paying its share. The project team wants Oregon to go ahead on its own, but state Treasurer Ted Wheeler has raised questions about that. The Glenn Jackson Bridge on the Columbia opened in December 1982 after five years of construction. It cost $170 million. The new crossing has been estimated to cost about $3.5 billion if and when it is ever built. But it seems there are just too many obstacles, one of them being that it depends on approval of too many different interests and agencies. The Oregonian reported that 59 consultants, not counting various agency reps, worked in the project office before it faced being shut down when Washington balked in June. From Rich Kellum, via Facebook: Kill it, kill it and then kill it again. Vancouver does not want light rail, the design is so low that it keeps everyone who is upstream from Portland from EVER doing large welded projects — EVER. Start over; make it a bridge that actually serves the entire population, or let us just lower the bridge in Astoria to 144 feet and see if Portland still wants it.